From the above screenshot, you can observe that we have 60398 records with many duplicates. 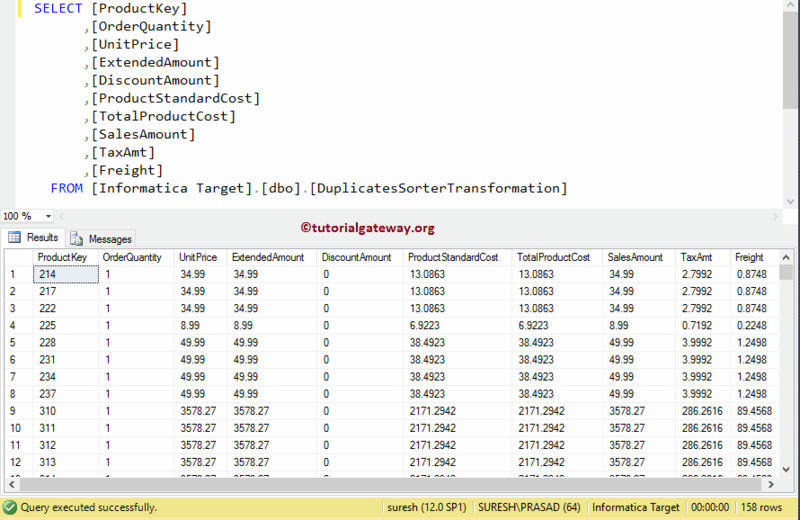 Our task is to select distinct records or remove duplicates using sorter transformation in Informatica. 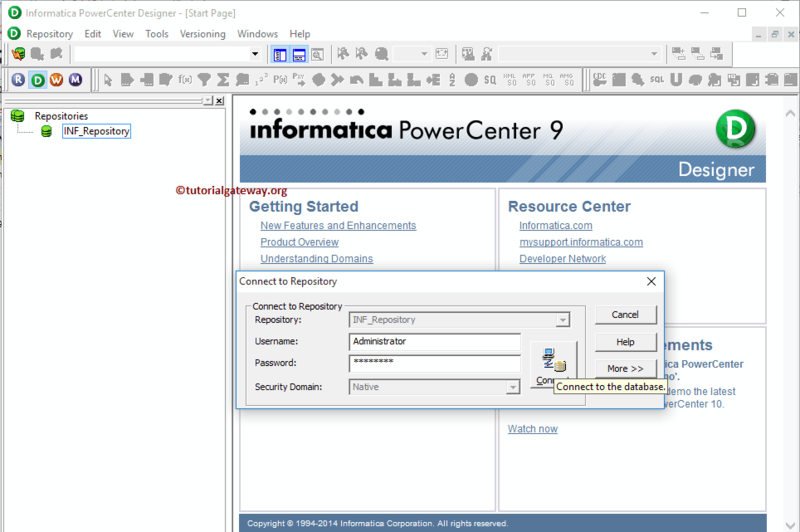 Before we start doing anything, First connect to Informatica repository service. 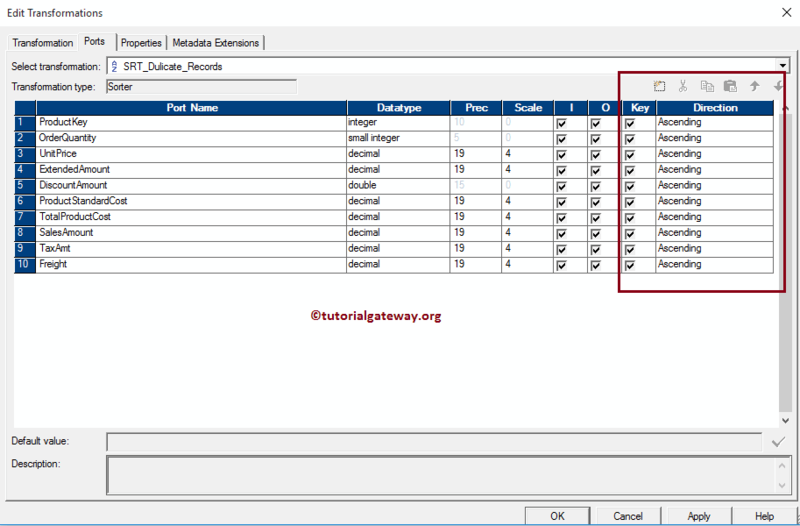 In order to connect with the Repository service, we have to provide the Informatica Admin Console credentials. So, Please provide the appropriate Username and Password and click on Connect button as shown below. 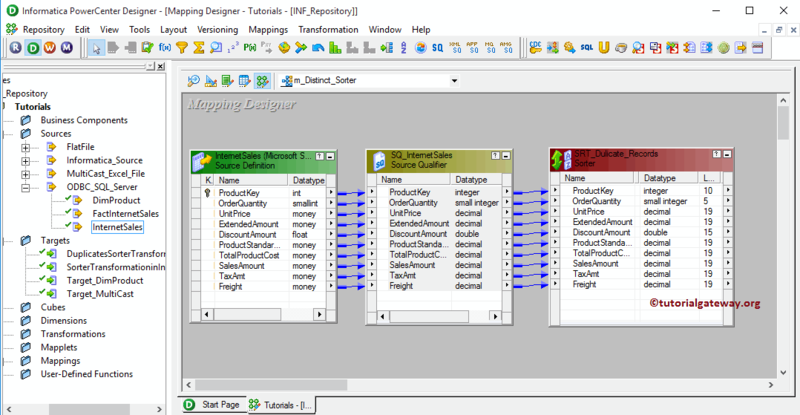 Next, Drag and drop the [Internet Sales] source definition from Sources folder to the mapping designer and create sorter transformation. 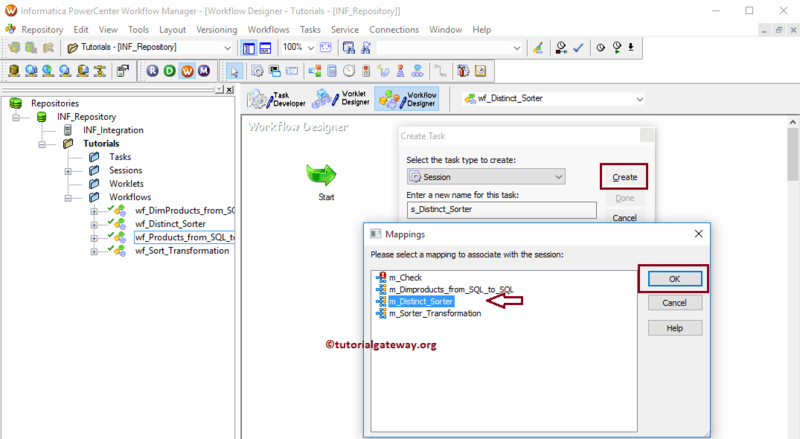 In order to remove duplicates, sorter transformation requires some data so, we have to connect the Source definition with the transformation using the Autolink.. option. 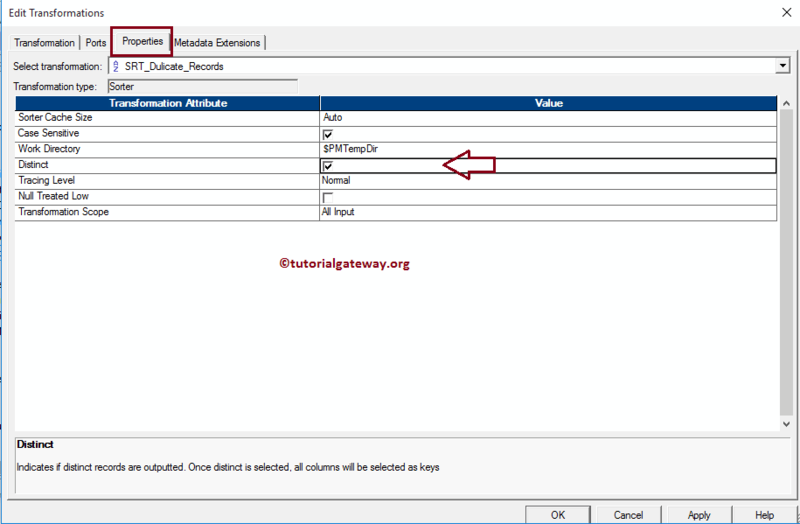 TIP: Please refer Sorter Transformation in Informatica article to understand the steps involved in configuring Sorter transformation. 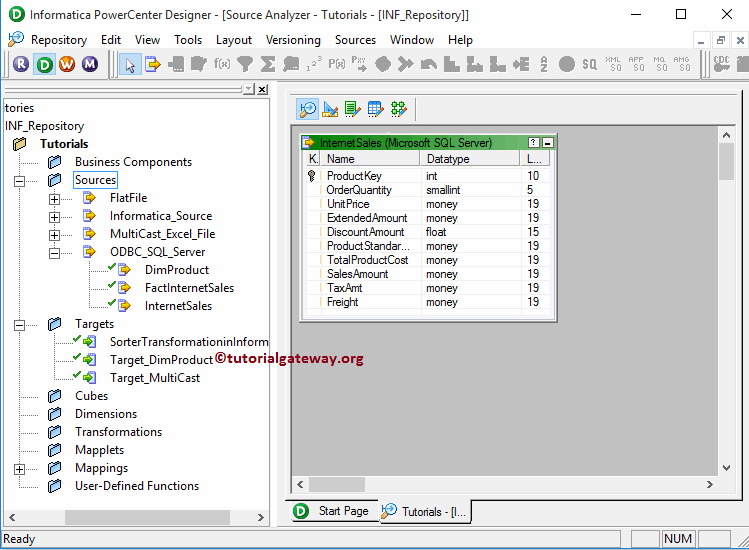 Double click on the Sorter transformation to configure the properties. From the below screenshot you can observe the list of available properties in Properties tab. In this example, we want to remove duplicate records so, checkmark the Distinct property. Next, If you observe the Ports tab, Sorter Transformation is sorting all the input columns in ascending order. Remember, you don’t have to do anything here. Click OK button to finish configuring the properties. 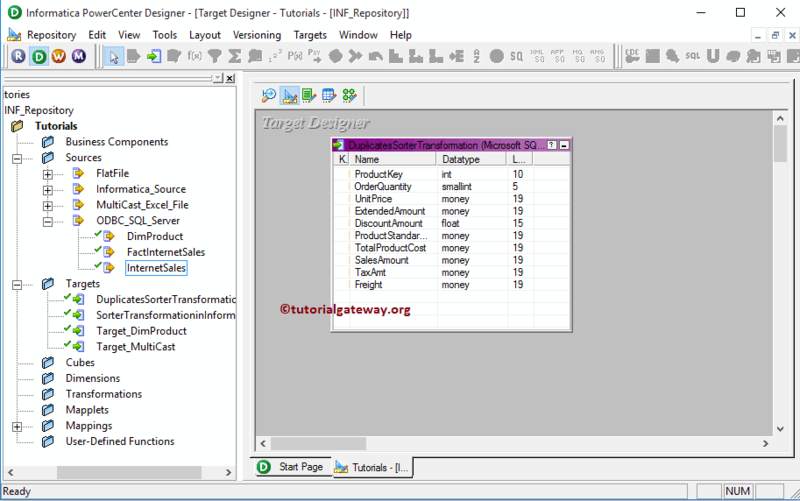 Next, Drag and drop the [Duplicate Sorter Transformation in Informatica] target definition from Targets folder to the mapping designer and connect the Sorter Transformation with the target definition. Please use the Autolink.. option to connect them. In this example, we created the Workflow manually. Once we created the workflow, our next step is to create a session. For this example, we are going to create Non-reusable Session. In order to create Non-reusable Session in Informatica, Please navigate to Tasks Menu and select the Create option to open the Create Task window. Here you have to select the Session as Task type (default) and enter a unique name for the session. 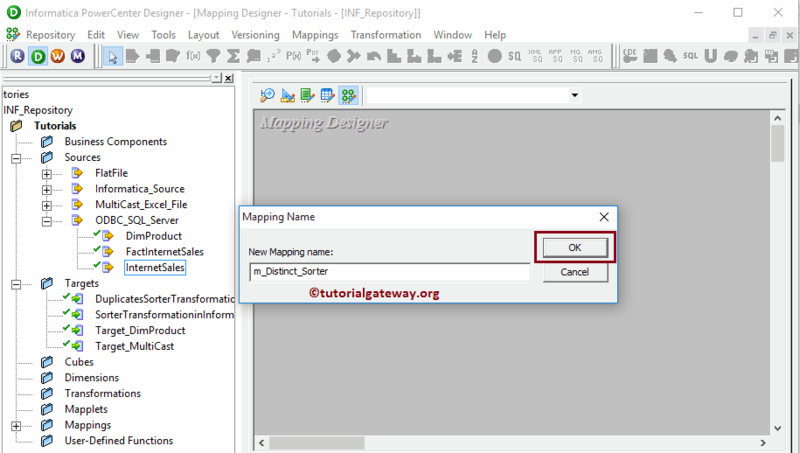 Once you click on the Create button, a new window called Mappings will be opened. Here we have to select the mapping you want to associate with this session. From the below screenshot you can observe that we are selecting the mapping that we created earlier (in Step 3). Although we have to configure sources, Target and some common properties, we are not going to explain them here. 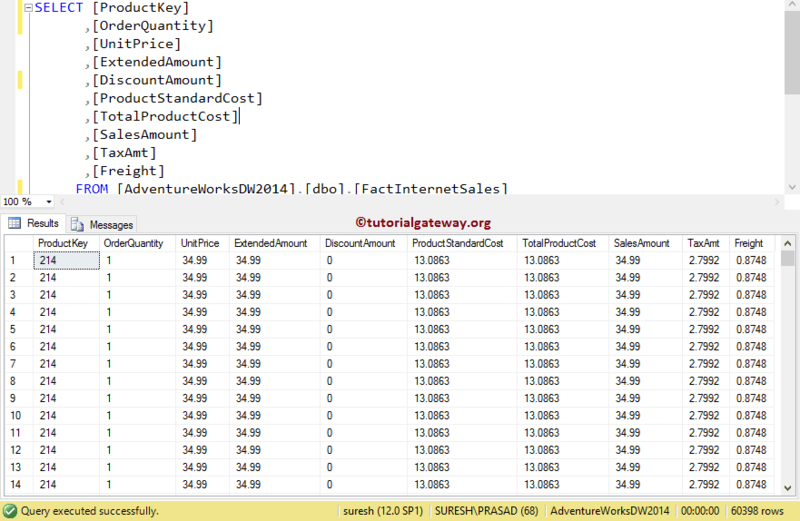 Please refer Session in Informatica article to understand the properties. 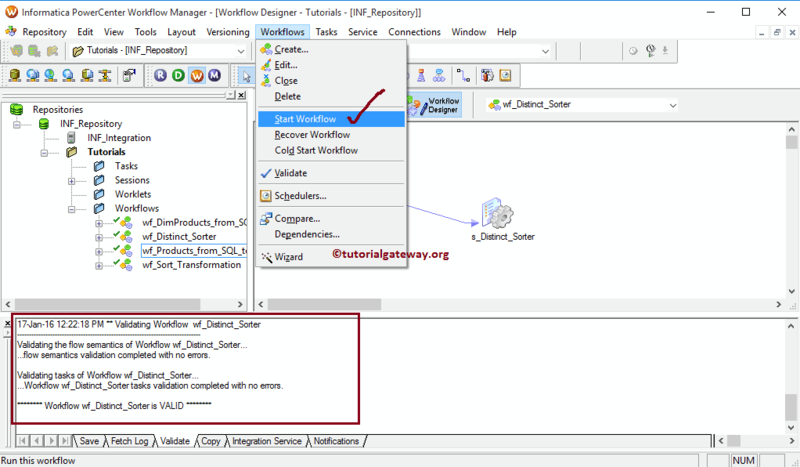 From the below screenshot you can observe that the Remove Duplicates Using Sorter Transformation in Informatica workflow is a valid one. Now, Let us start the Workflow by navigating to Workflows menu and selecting the Start Workflow option. 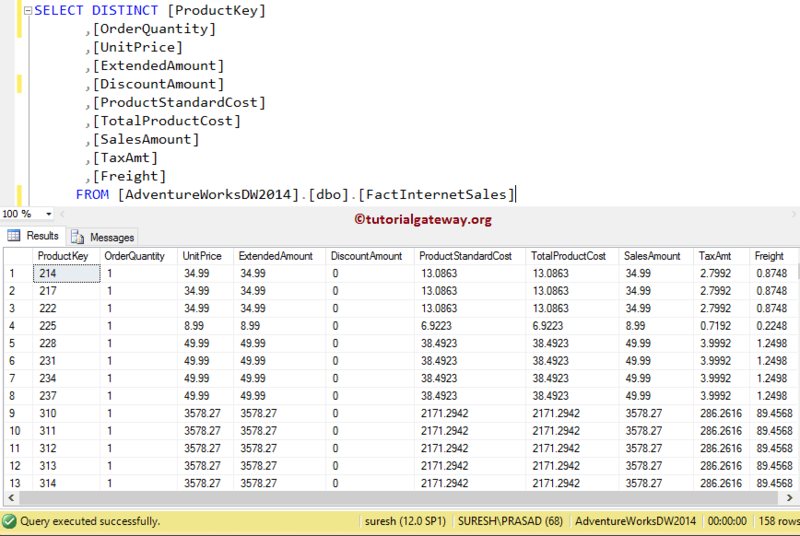 Let us open the SQL Server Management Studio to check whether we successfully remove duplicates / transferred the distinct records from Adventure Works DW to the Informatica target database.